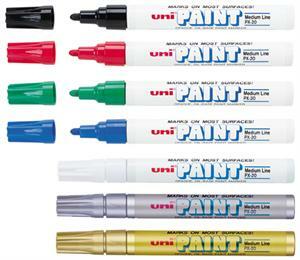 Uni paint markers, one of the most popular markers on the market, offers oil-based paint in a handy marker. These paint markers work on a variety of surfaces, such as sheet metal, auto parts, glass and pipes, as well as wood, concrete leather stone, or tile. 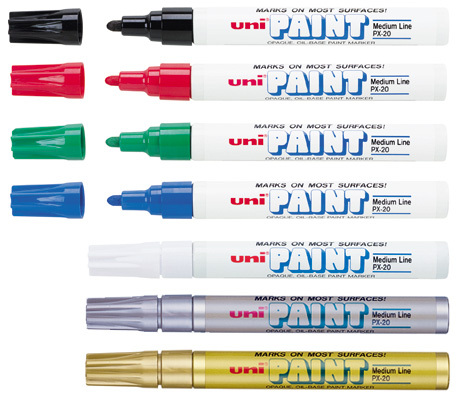 Hobbyists, construction professionals, and manufacturers have come to rely on these markers. These medium point markers feature a 1/8" pointed tip and are available in 15 bold fade proof colors. You can purchase individual markers or select 6 and 12 multicolor sets.